It is a week to until Wildflower, having not run or cycle since the Boot Camp weekend, I wanted to get a bit of riding in before race. 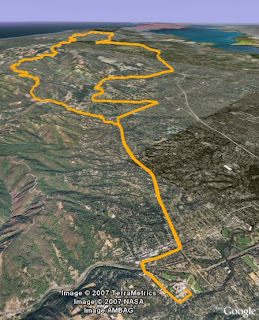 The cycle team had organized a ride starting in Los Gatos, going up Highway 9 to Skyline with a couple options for return, either 84 or Page Mill, back to Foothill Expressway and back to Los Gatos. We started off the ride at 8:30am, surprisingly it was already starting to get quite hot, as it was a unsupported ride (no SAG or Water stops) I came prepared with plenty of fluid to keep me well hydrated, enough to last a good 65miles or so. We started off in a group climbing up Highway 9, it was just over one hour from the start of the ride when we finally hit Skyline. My cycle coach Matt, suggested I turn around go back so not to over things before next weekends race (always taper), however the ride was just getting to the good bit and I don't always take good advice my coaches offer me (sorry Mike, Dan, Kristen & Matt) so I continued on. I whisked along Canada road, stopping to take a couple more blurry photos. As I reached Woodside, I was starting to think about my mileage, the heat and my head which was pounding. I continued along back to Foothill Expressway, via Sand Hill and decided having gone 60 miles it was time for lunch. So I stopped at a Cafe and had a sandwich and a Ice tea. It was a needed as deserved break, it was then I realized I still had nearly 20 miles left to go. I started off again, I should note is was just over 80F by now. Being the highly resourceful person that I am, I used the Ice from my Ice tea for my bottle of Gatorade to cool it off, the fact that there is nothing like warm Gatorade is good thing. I had one final climb to go which the ascent up Mount Eden, although it is something I had done many times, it seems a little different having already done 70 odd miles with a lot of climbing, still I managed to make up and over. From there I just dropped down in Saratoga, on to Highway 9 with only few miles to go. I arrived back at Los Gatos at 2:35pm.